At Boku Slots we love a bit of word play and as the name would suggest, there are some big wins available from our latest game review. But there’s more to Tunzamunni Slots than just a catchy title to entice us in. So what exactly does this popular game from Microgaming have to offer you? Tunzamunni Slot centres itself around an ancient tribal treasure theme. It’s somewhat reminiscent of something you would expect to see in an Indiana Jones movie, but without the whip yielding archaeologist to help guide you. It was actually Microgaming’s first crack at a progressive slot game, so features a classic one pay line and three reel layout. The RTP of 90.04% is a little lower than most modern games but there’s a very good reason for that. Bet Amounts – Betting ranges from 5p per spin to 25p per spin with Tunzamunni, making it one of the cheapest games to play; which is handy for those who just like to spin for fun. You can choose to limit your coin level from 1 to 5 coins, but if you want to try your luck with the jackpot you have to select the 5 coins and 25p per spin option. Progressive Jackpot – In our opinion this makes up for the low RTP. The thing we love about progressive jackpots, is the fact that you can see the usually large prize pool increasing right before your very eyes. Unfortunately though, as the jackpot is so big it can often be a little more difficult to win. 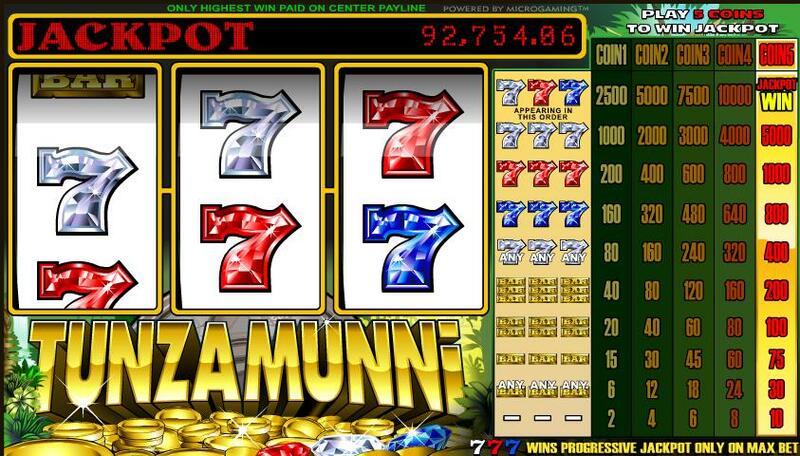 In the case of Tunzamunni, you need to have done two things in order to land the jackpot. You need to land a silver, red and blue 7 on the pay line in that order. This seems simple enough, but with just the one pay line it’s not as easy as it would first appear. But with such a low bet amount, there’s no need to get greedy and play beyond your means in search of the big win. Which is important when trying to gamble responsibly, like we always advise players to do. Other Symbols – Tunzamunni operates a very simple symbol pay out structure, so you will only see typical 7’s and gold bars in play on the reels. The 7 symbols range in colour order from highest to lowest. There is silver, red and blue, so combine any 3 of these symbols to win 400 coins. Don’t forget, hit the right combination of colours and you can drop the jackpot. The bar symbols also differs slightly appearing as one, two or three gold bars. 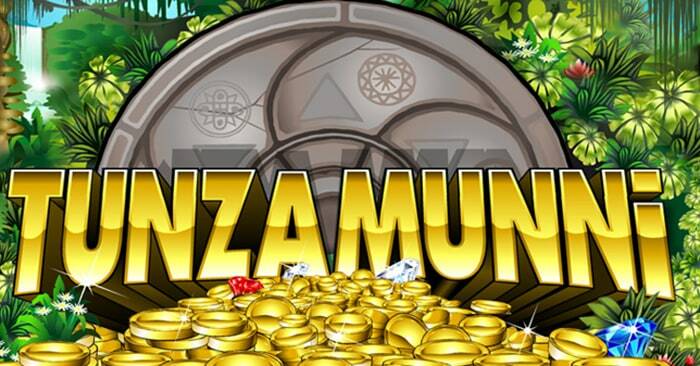 Tunzamunni is relatively easy to play and has great returns on your stake amount, despite having just the one pay line. We understand it may not fulfil everyone’s gaming needs. But if you are accustomed to playing games with lots of features and pay lines, we don’t think this is the game for you. The reason we enjoy this particular game is because it’s great to come back to whenever we’re in the mood for something with a classic, or old-fashioned feel. It doesn’t have the excitement of other slots, but it’s reminiscent of the games we use to play in a seaside arcade or local pub.